The insanity of the Chinese Super League’s all-out assault on the traditional soccer hierarchy continues apace. All of it is shocking and none of it makes sense but this does indeed appear to be the new reality. After dominating last winter’s transfer window, throwing increasingly mind-boggling sums of money at very good, European-quality players, the Chinese league has re-announced its presence by coming to an agreement with Chelsea for the purchase of Oscar—a 25-year-old player who just a couple years ago was well on his way to becoming a veritable superstar for one of the biggest clubs in the world and for the Brazilian national team—for an unbelievable amount of money. Reports of the transfer fee Shanghai SIPG is set to pay (the deal won’t be finalized for a few days) vary, but it’s something between €60-70 million. The specifics here don’t really matter, because whether the actual fee is at the higher or lower end of that range—whether it is one of the 10 highest fees ever spent in the history of the game or if it merely cracks the top 15—it is still Premier League club Chelsea selling one of its brightest, cusp-of-his-prime-age talents for an astronomical heap of cash to a club you’ve probably never heard of in a league you’ll definitely never watch. If those transfer figures weren’t enough to get your eyes watering, this next one should do the trick. The salary that (uh ... “SIPG”? Just “Shanghai”? A team just completely upended the economic structure of the biggest sport in the world and I do not know how to properly refer to them. This is so nuts.) 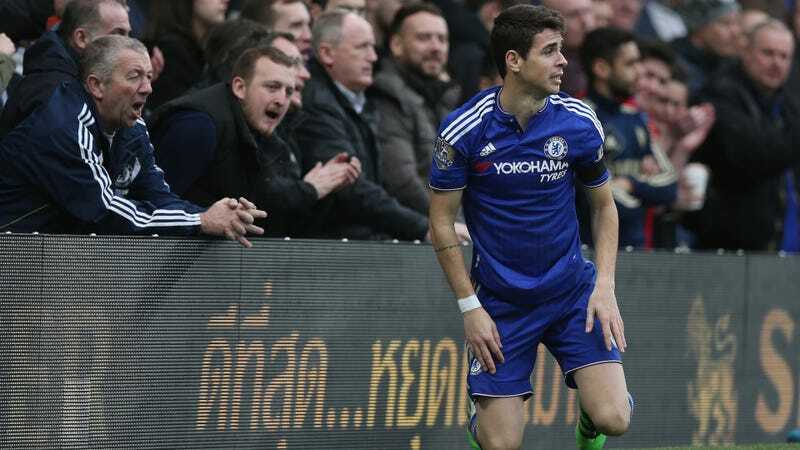 the Shanghai-based club has reportedly offered Oscar is £400,000 a week. Almost $70,000 a day. More base salary than Barcelona pay Lionel Messi or Real Madrid pay Cristiano Ronaldo. Those two probably still come out ahead when you factor in all the bonuses they get, but still. By one significant metric, Oscar will soon be the highest paid soccer player in the world. Of course, maybe Oscar won’t ever officially claim that designation. The other half of the Shanghai Derby (is that a thing, the Shanghai Derby? I have no idea who any of these teams are nor their rivals AND THEY ARE REVOLUTIONIZING MY FAVORITE SPORT HELP ME), Shanghai Shenhua, are by all accounts only days away from making Carlos Tevez their newest player. Whenever Tevez signs his deal, the Argentine striker’s reported salary of £615,000 per week (FANJKSJNGLFABSGLNSGLIUH) would dwarf even Oscar’s. Oscar better hurry up and sign if he wants to enjoy being known as the world’s highest-paid player for a few hours. The numbers here are astonishing, but for the most part they aren’t too out of line from what we’ve seen from the Chinese league before. Alex Teixeira cost Jiangsu Suning €50 million back in February, and Graziano Pellè joined Super League players Hulk, Ezequiel Lavezzi, and Jackson Martínez on the top 10 list of the world’s highest paid players in July. Oscar leaving Chelsea, though, feels different. He’s not an older player who’d already accomplished everything he could at club level the way Lavezzi and Pellè had, nor has he been slogging away in one of Europe’s less-prestigious leagues as Hulk and Teixeira had. He is just 25 years old, already at one of the best clubs in the world, and had been making good money for years (his current deal reportedly nets him £90,000 weekly). He had even turned down another Chinese team’s offer just a year ago when they came knocking with an even bigger transfer fee. Sure, Oscar was on the outskirts of Chelsea’s squad, but another top team in Italy or France or Spain undoubtedly would’ve come for him soon. Again, it wasn’t all that long ago when people thought Oscar would be, alongside with Eden Hazard, the foundational blocks around which Chelsea would construct their entire squad for the next decade. Just a couple years ago he was one of the best young players at the World Cup, and now he’s shipping off to China! No one can be sure how long this commitment to grossly overspending to attract high-end talent will last, and it’s quite possible that the bubble will burst sooner than later. But for right now, something we’ve never seen before truly is happening. (For example: imagine MLS signing any one of Oscar or Teixeira or Hulk, and the unending bellowing about the league finally becoming a true power player on the world stage that would emit from the mouths of the league and its fans.) For right now, the Chinese league is real as hell.